Paul Lawrie says captain Jose Maria Olazabal had total faith that Europe's golfers could complete a clean sweep in Sunday's Ryder Cup singles at Medinah. Europe secured 8½ points out of a possible 12 in the singles to clinch a 14½-13½ win over the United States. Lawrie says Olzabal told Saturday's team meeting that all 12 European players could win their matches. 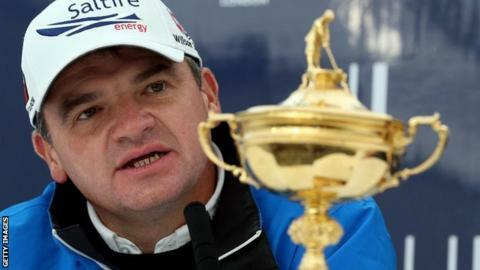 "You could see that he believed we could win the Ryder Cup even from 10-6 down," Lawrie said. "He believed we could all win, never mind 8 or 8½ points. When someone like him says that, it makes you think you can do it. And that is what we did." Lawrie had been omitted from both sessions of foursomes and then lost in the fourballs, first with Swede Peter Hanson and then with Belgian Nicolas Colsaerts. However, the Scot comprehensively beat FedEx Cup winner Brandt Snedeker 5&3 in the singles. Lawrie flew into Gleneagles by helicopter on Wednesday to hand over the Ryder Cup to the Perthshire course, which will host the 2014 tournament. Lawrie, 43, is playing in this week's Dunhill Links event in Scotland, which has a pro-am format. The 1999 Open champion is competing alongside his 17-year-old son Craig, a scratch handicapper who caddied for his father at the Scottish Open in July. He joins fellow Ryder Cup winners Peter Hanson and Martin Kaymer in this weekend's event. All four European vice-captains - Darren Clarke, Paul McGinley, Thomas Bjorn and Miguel Angel Jimenez - are playing, as well as American Ryder Cup team member Dustin Johnson. Most of the star players start at Carnoustie on Thursday, then switch to Kingsbarns on Friday before playing St Andrews on Saturday. Among the amateur golfers taking part are Hollywood star Bill Murray and the most successful Olympian of all time, swimmer Michael Phelps.